Hi, my name is Joey Davidson and I am a Ratchet & Clank addict. I've played every adventure in the franchise and look forward to each new entry that Insomniac slowly drip-feeds the world. Yes, even the disastrous All 4 One. When Sony and Insomniac announced that Idol Minds would be tooling up for an HD collection of the original Ratchet & Clank trilogy on the PlayStation 3, I was ecstatic. Perhaps my only complaint about the news was that the collection wasn't getting a PS Vita release to boot. This collection includes Ratchet & Clank, Going Commando and Up Your Arsenal. So, how do the original games hold up? Give us a few moments and will hit the biggest points for your consideration. This HD collection has received, you guessed it, HD touch-ups. When the title is in motion and you have control of Ratchet and Clank, the product is gorgeous. It's missing some nice particle effects and extra special touches that make modern games so gosh darn fancy, but it's still a nicely rendered effort. The toony nature of the franchise shines, colors are vibrant and the lush worlds like rich and large. The cutscenes, however, weren't touched at all. In fact, they look almost exactly like they did back when these originals were released on the PlayStation 2. The devs didn't take to polish them up, re-do them or re-format them to fit the modern 16:9 aspect ratio. That's right, as you're playing this game drops its resolution and scale in order to present you with cutscenes. Cutscenes are typically the most gorgeous bits within these experiences. Here? They simply aren't. What a difference a strafe makes. 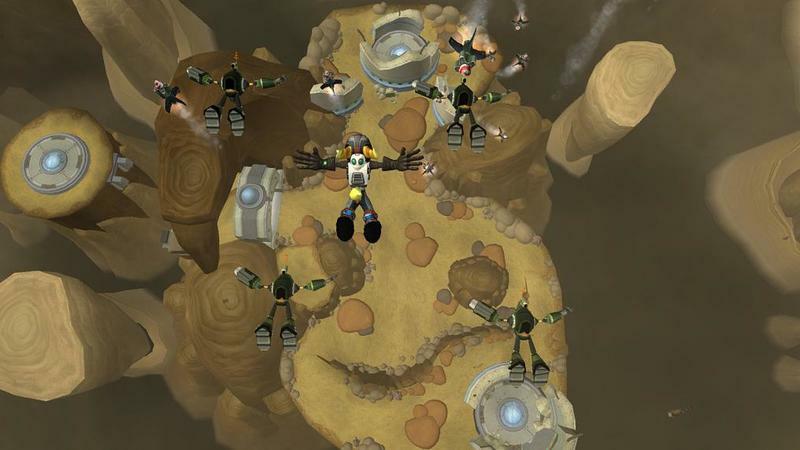 The strongest criticism I have for the Ratchet & Clank Collection is one that, quite honestly, isn't really a problem. It's a sign of age, a sign of gaming 10 years ago and a sign of growth in design techniques. The gameplay in this trilogy, especially in the originally game, feels exceptionally dated. The best and most thorough example I have of this comes from the lock and strafe action that's been standardized in recent years. In a third person shooter/platformer, which this game becomes at times, the ability to lock on to opponents is incredibly important. 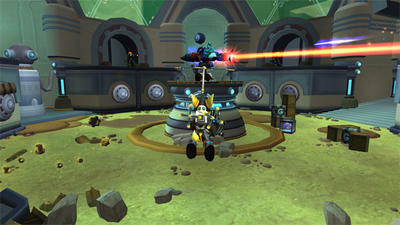 In later Ratchet & Clank offerings, Ratchet can lock onto enemies and strafe around them. That means dispatching more powerful foes while hopping and dodging is possible. Here? Not so much. Combat is harder because of the almost random nature of firing. You can zoom in on enemies, but that greatly reduces your maneuverability. Again, this is a problem with the original product, not just the port. It's only a shiny port, if that's your thing. Which brings me to my final push. This is a port. Nothing has been improved (aside from graphics) and nothing has been added (aside from 3D support and PSN multiplayer for Up Your Arsenal). That said, if you loved Ratchet & Clank or you want to experience the original trilogy in pretty graphics, this is almost a perfect recreation. Minor pieces of the puzzle are missing, and they'll only be noticed by incredibly diehard fans. For the rest of us, this spot-on HD upgrade is enough to relive the classic nostalgia. Plus, these three games are currently being sold at retailers for $29.99. We think you should buy it, but understand that its aging mechanics occasionally hold the experience back. Why no score? With remakes and HD touch-ups, we feel there's no reason to assign a numerical score. The games have been critically graded by a bajillion publications in the past. Our job with these particular offerings is to tell you whether or not they both hold up and are worth your time. Buy it, rent it or skip it. It's that simple. We purchased a copy of the Ratchet & Clank Collection for the PlayStation 3 with company funds. We played the original game to completion and nearly 50% of the others before starting this review.